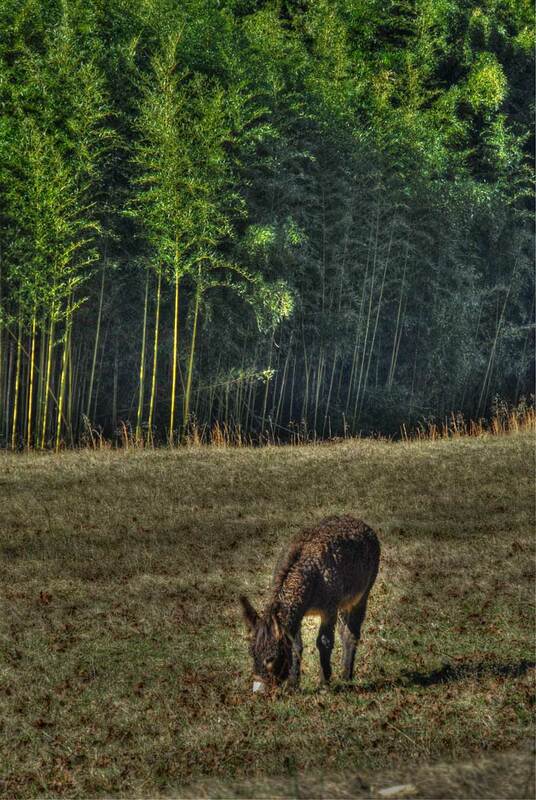 I first saw this particular donkey about 8 months ago. It was raining lightly and there was a slight fog. He was much closer to the stand of bamboo. Alas, I was unprepared to take a picture at that moment, though I have the image retained quite clearly in my memory. Since that day, I have carried my camera at the ready each time I have gone past this site in hopes of catching the picture of the donkey with the bamboo in the background. No less than twenty passings of this site and yet no glimpse of the donkey - until Christmas Eve-eve. 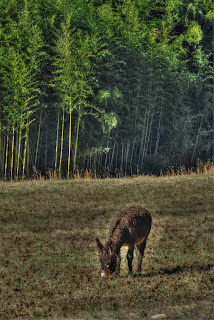 A car-load of people, my mom and dad included, all looked at me as though I was mad, as we stopped alongside of the road and called to the donkey trying to get him to look up. No luck on the looking up bit, however I did get several shots.